Imagine if you were working on a 40-year-old computer at your office. Your IT department wouldn't even know what to do with it. That's the problem NASA's Voyager mission faces. The spacecraft was built in 1975 and has a computer from the Atari age. The last guy who truly understands how to program it is 80-year-old NASA engineer Larry Zottarelli. NASA's Voyager 1 spacecraft is 20 billion kilometers away from Earth (in 2013, it became the first man-made object to leave the solar system). The primary mission of Voyager was to explore Jupiter and Saturn, but its mission was extended long beyond its intended purpose. Needless to say, it would be a little difficult to upgrade its on-board computer. "It's like flying an Apple II computer," said Suzy Dodd, Voyager's project manager. "It should be in a museum." Zottarelli has been on the Voyager mission since the day it launched: September 5, 1977. He works on Voyager's flight data systems, which have just 64 kilobytes of memory (0.000064 gigabytes) and run a long-since retired computer language. 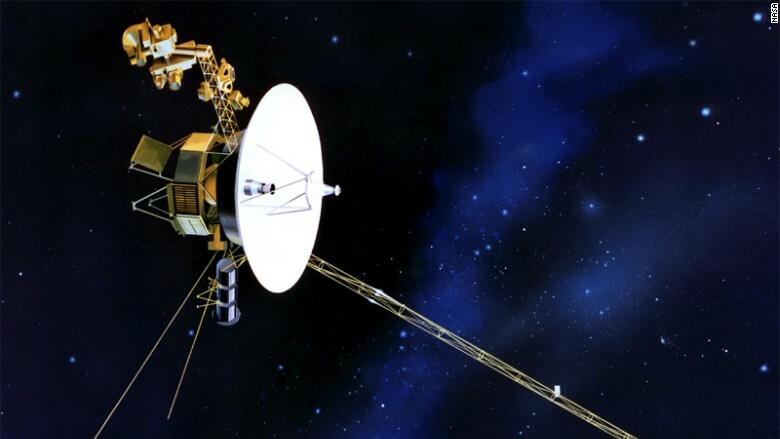 To determine that Voyager 1 had left the solar system, the team had to listen to audio recorded by Voyager's 8-track tape recorder (interstellar space sounds different than the outer reaches of the solar system). But Voyager was only programmed to play back its recordings for 45 seconds twice a year. Dodd wanted to get Voyager to speed that up a bit. "Larry is a puzzle solver," she said. "It's like Tetris. You have to figure out how all the blocks fit best together -- except when you put things in, you have to take other things off." 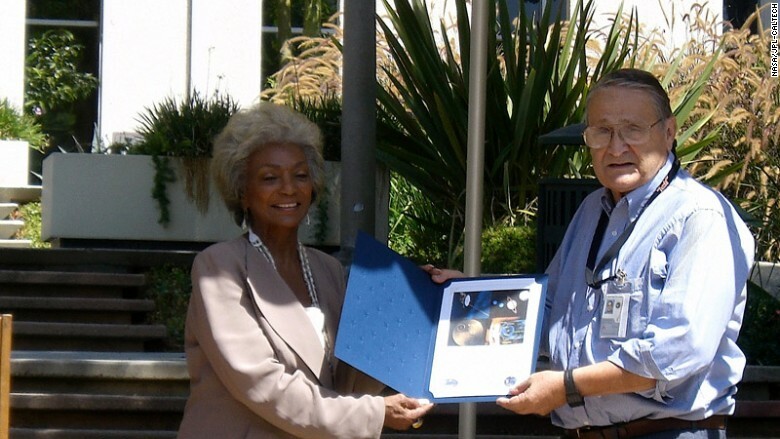 Nichelle Nichols of "Star Trek" poses with Voyager operations team member Larry Zottarelli, who received a certificate of appreciation for being on the Voyager team since launch. The award was on the 30th anniversary of Voyager (2007). Understanding how to do that has been a huge challenge for the team of relative newbies. Dodd was just 16 years old when Voyager launched. Some of the instructions have gotten lost -- and manuals only go so far anyway. "We often have questions about how something works," she said. "People who work on the project now don't know why something was built a certain way -- and with Voyager in its 38th year, it's hard to find the documentation that goes with it." Virtually every document about Voyager was printed or written down on paper. Each time the Voyager team moved locations, some of the papers would be lost during the packing process. Dodd has a secretary whose full-time job is scanning paper about Voyager into a document cloud system to make the manuals easily searchable. But engineers don't always write stuff down. Some Voyager engineers have passed away, taking the spacecraft's secrets with them. For example, the Voyager team realized last decade that part of the spacecraft's flight software was going to turn off in 2010. Dodd called as many retired engineers on the Voyager team as she could, but no one remembered why that routine was programmed into Voyager. Dodd and her team guessed that no one dreamed the mission would last as long as it has, and the team wanted to ensure that there was enough power for some of Voyager's other routines. She opted to override that command and keep Voyager running. With Zottarelli retiring, the challenge is to bring someone on who knows older programming languages and isn't 80 years old. "Finding people who can do that are few and far between," Dodd said. Though NASA found a younger engineer who was brought on to work with Zottarelli for a year and eventually replace him, Dodd said it's an impossible task. "No one will replace him," Dodd said.